Rachel loves dresses and jewelry it would appear. And Grandma loves buying her special things. 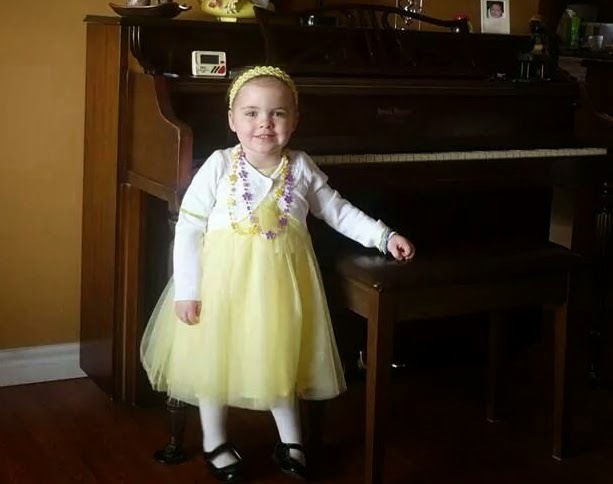 Here she is in Grand Falls with Susan’s parents over Easter – thanks Juanita for the photo of her in her dress! She’s as sweet as can be. But early ~ very early says Luke ~ the women went to the tomb intent on paying their respects and assuming they needed to prepare the body of Jesus for burial according to Jewish custom. What they discovered was that there was no need for them to prepare for death. God had raised him from the gave and demonstrated his power over death.